"Grounded" - Part Four: "Visitation Rights"
William races home with some amazing news, Superman, the Man of Steel is visiting Chicago! But not everyone is pleased to see him. After the way Danville was wrecked by the orchestrated Super fight, people distrust Superman and even fear his magnetism for trouble and they waste no time in telling him that. The possessed school teacher it seems has also been walking across America, though Superman fails to recognize her from the big news coverage as she weaves here strange plot. He takes a break from his depressive public meeting to meet with Lois who heavily hints the walk is a bad idea, her husband however doesn't heed her warnings and is adamant the journey must still unfold. Before the fight in Danville people would never have had the guts to approach him in the way they did as he arrived in Chicago. As Lois and Clark share a night in a motel and he drifts to sleep, his dream drifts to a Metropolis in ruins. The school teacher is in his dream and mocks him and his plan to reconnect with humanity. A giant three headed beast battles Superman and the teacher asks him: "Are you willing to die for them?" just as the monster is about to connect its killing blow. 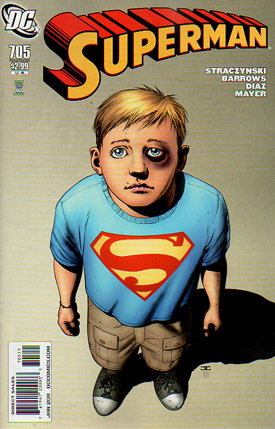 Superman stirs uneasily and heads to the bathroom Lois alerts him to the fact his face has the bruised and battered appearance from his dream, could the dream have been real? Elsewhere William is painting a banner for Superman, so he will visit his home. It turns out his reasons for wanting the visit so badly are an abusive father. In a parallel we see William and Superman freshly battered, having make up applied to hide their bruises. Superman continues his pride march and William is putting up the banner so Superman will put a stop to the violence he and his mother endure. A crash of ceramics brings William to a familiar scene, his father is beating his mother and William finally has the courage to step in. A slap to the face later William is hurled into the basement where he knocks himself out. The tide of opinion in Chicago at least has turned and Superman basks in the cheers and claps, leaving town. The commotion outside awakens William and fearing it's too late he calls for help, luckily, Superman hears him. William sees his rescuer and recognizes the mask of make up. Superman is enraged and puts William's father in his place. Frustrated by the law and procedures, Superman is more than a little unhappy that William's father could quite easily return home to threaten William and his mother again, so he steps in and gives the little boy a voice-box number. William should call it every day, no matter what, and if for some reason he doesn't Superman will return to restore order. The social worker is impressed and tells Superman it needed him involved to resolve the situation or they might never have known it was going on. Superman shakes his head and points out it's down to the everyday man, woman and child to look, see and report - if they have the compassion. The dream sequence was just plain silly; would he die for mankind? - Did this creative team forget to pick up any Superman comics over the last 75+ years? Clark is a hero 24/7, in his Superman persona he lays his life on the line ever day. Hey how about the now famous Superman #75 - you know, where he DOES die for them? 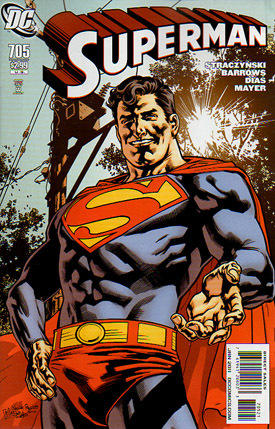 The abandonment of Earth in the New Krypton story and the two years of destruction in that time didn't make mankind hate and fear him... but a fight in Danville with a local drunken oaf (granted, a super-powered drunken oaf) is what finally turns the tide of public opinion against Superman? Sigh... and just by him walking through a city, it turns back again? Sigh... I think creative Super Teams could do with a few lessons from Peter David... I'm not sure what's going on with Superman and Action Comics at the moment, they can't blame New Krypton for the mess, Grounded and The Black Ring are just... unwanted and, well, boring. The preachy ending in two panels tried to pay homage to Superman: The Movie's "We're all part of the same team" line but came across as deeply condescending. Please listen to Lois and the fans - go back to being Super or better yet, a Man. Art - 3: The art is really mixed - it doesn't flow well, one minute it's all cartoony and giant glassy eyes, the next it's all shadows and grinding teeth. The cartoon effect really distracts and of course Final Fights Haggar as the storyline villain doesn't help! (OK I was joking about that part). Double teaming both the pencilling and inking chores really doesn't help - in fact it makes it really, really messy. Cover Art - 2: As unsettling as it is to see a child with a black eye, does it really, honestly make you want to pick up the book? For me it made me curious, but it certainly didn't make me rush to buy it. Cover Art (Alternate Cover) - 2: As a duo the covers work in composition (but again not in execution), but isolated they don't. Superman looks like he's chatting to a friend. Nice to see him relaxed but not exactly befitting the story.